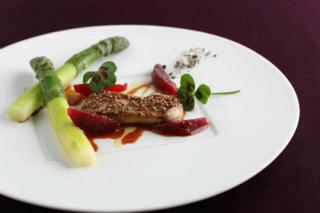 Foie gras at Melisse: image via facebook.com/melisserestaurant#! CHEFS ( the Coalition for Human and Ethical Farming Standards) is the organization formed by chefs from various cities and regions of the state to protest the law and to persuade patrons that foie gras is not only a sublimely smooth and tasty treat, but one that is ethically obtained from a duck or goose. Foie gras at Melisse: image via facebook.com/melisserestaurant#!But, so far, it's been the animal rights activists in the state whose voices have been heard, as they try to save thousands of ducks and geese from being force-fed by tubes in order to fatten their livers. 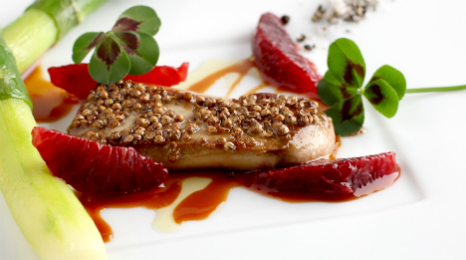 Foie gras is French for 'fatty liver,' you see. Artisan Sonoma Foie Gras Farm, the only foie gras farm in California for 20 years, will be shut down if the no foie gras law goes into effect. Apparently, the farm uses a less forceful method than the strict French methods, but they do not claim the birds are not force-fed. The farm owners and the restaurateurs are claiming that the new law is unfair, as it singles out foie gras, but ignores all of the other meats that are obtained inhumanely. There, they have a point.